Emma’s struggles with bowel disease continue. While on the maximum steroid dosage her appetite returned to the point that she was eating several times her normal amount and at least stopped losing weight, even if she wasn’t gaining it. But as we tapered off the steroids the vomiting and loss of appetite returned, so we put her back on the maximum dose. Her appetite returned and she seemed again to be holding her own but she had a rough night last night full of vomiting and diarrhea. This morning she wouldn’t touch her food and had no energy, although at least she was still drinking water. 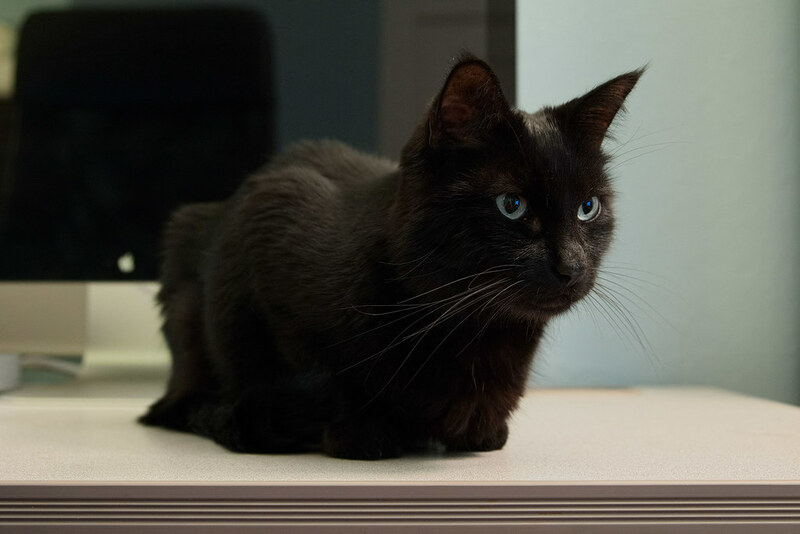 She had another visit to the vet with some injections and came home a little feisty, which was good to see as this morning I was afraid we were losing her. She ate some tonight and just came up and kneaded my stomach for a while and purred and purred. She was even getting pretty talkative, unusual for our quiet cat, and now she’s sleeping beside me. It did my heart good to see my little buddy happy again, now we just need to get her healthy too. I took a much needed day off from work to go hiking in the Columbia River Gorge. I got a bit of a late start and intended to hike from Wahkeena Falls to Angel’s Rest but I was having so much fun taking pictures on the way up that by the time I got to Fairy Falls I decided to take a few self-portraits with my new backpack and head back down. The tricky part was standing still for nearly a second, especially since I couldn’t hear when the shutter clicked due to the waterfall so I had to guess at when it was OK to move. 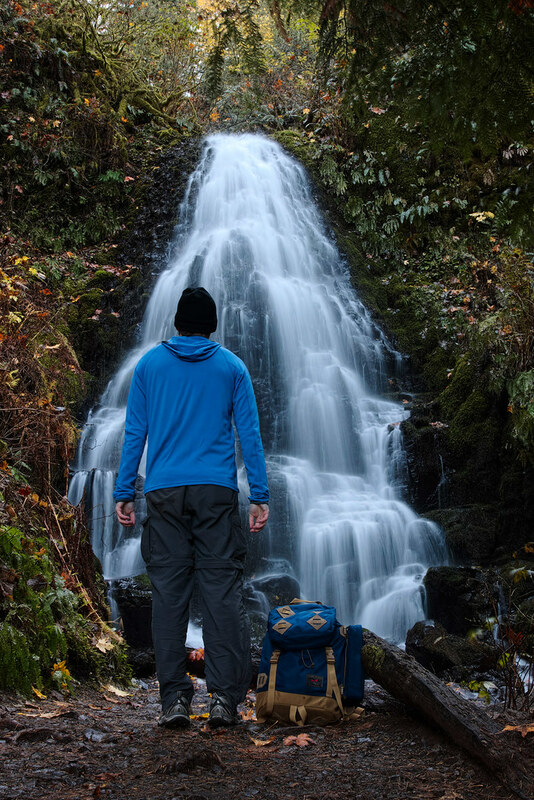 The Columbia River Gorge has a variety of spectacular waterfalls but little Fairy Falls is one of my favorites, I find it so relaxing that every time I see it I think how nice it would be to have even a small version of it in my backyard. 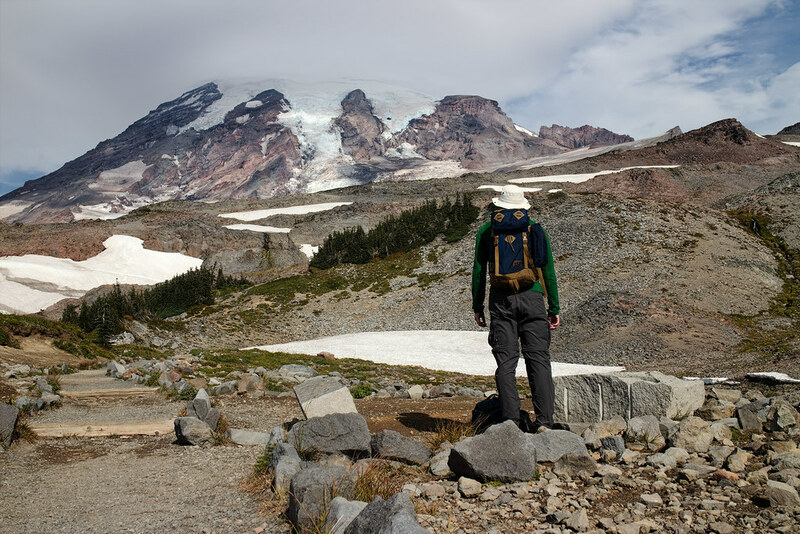 I was trying out a lot of new hiking gear on my weeklong hiking trip in September to Mount Rainier National Park and Olympic National Park. In the picture above, the hiking pants and hat are old, but everything else I’m wearing is new right down to my socks and shoes and undies, and it all worked out rather well. The green wool hoody I’m wearing, an Ibex Hooded Indie, I loved so much when I got home I ordered two more for myself and another for my wife. The backpack is The Guide’s Pack from Tom Bihn, this was my first time hiking with it and it did great. In the pack were more new items, including an Ibex wool coat (the Shak Lite) and an Outdoor Research rain shell (the Foray), both of which I was wearing earlier in the morning but took off as the sun came out, and both of which got tested over the next few days as the rain and cooler weather rolled in. I can’t speak yet to how they will wear with time, but so far I’m sold on the Ibex wool layers, they’re thin and easy to pack but dried quickly and kept me warm when it was cool but I didn’t overheat in warmer weather. This was my first time not wearing cotton layers and I was surprised at how much more comfortable I was, to the point that I began to feel rather foolish for not having moved away from cotton years ago. The Foray rain shell also did well, not a drop of rain got through and it seemed to breathe better than my previous coat. My shirts were some new synthetic shirts from a variety of outdoor companies as well as one wool shirt from Ibex, and those too I was pretty happy with. Cotton is still the softest but these performed much better on the trail when I started to sweat and were still plenty comfortable. Funnily enough it wasn’t my new gear that failed me, but rather my trusted old hiking shoes, I learned the hard way that they aren’t as waterproof as they once were. Fortunately I had brought some other new shoes that I pressed into service, even though I had planned for them to be more general purpose shoes. I’ll pick up some new waterproof hiking shoes this fall. 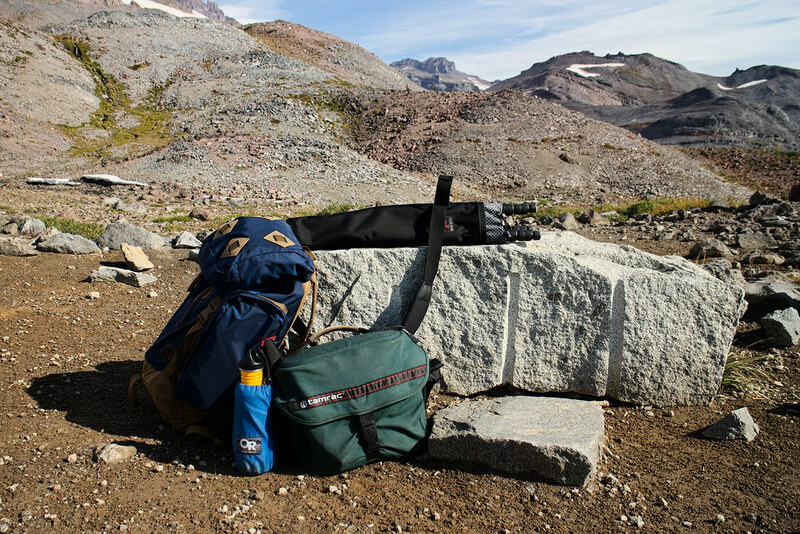 The rucksack design of the Guide’s Pack allows it to swallow a variety of loads. I ordered it thinking I’d pack it with my normal hiking gear, but when it arrived I realized it could hold my Canon 500mm telephoto lens. I hiked with the big lens quite a bit on this trip, too much to be honest, as it weighs 8.5 pounds and I wasn’t in good enough hiking shape for that much weight. The backpack has a frame which helped with the weight, but with all the elevation changes I ended up a bit too tired on some days. Normally I’ll carry a more moderate load as I realize this heavy of a load could shorten the life of both the bag and its wearer, but it’s nice to know I can take it on trails where I expect to see a lot of wildlife. 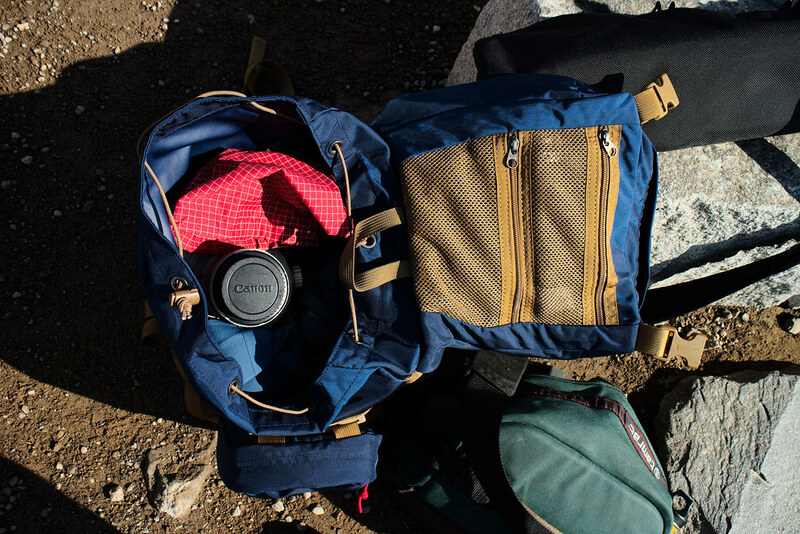 Which on this trip meant trails where from past experience I expected to see pikas and marmots and I came away with some pretty nice pictures thanks to the new bag. Still, I’d like to limit how often I carry that heavy of a lens and will look for something a little more portable than the 500mm lens but that can replace my aging 100-400mm lens, as it is in need of repairs but I’m hesitant to spend much money on it as it lacks some features of more modern lenses (including weather proofing). This was my normal hiking setup in terms of the bags I carried, what varied was how much camera gear I carried on any particular hike. The Tripod Quiver (also from Tom Bihn, and also new for this trip) held my Gitzo carbon fiber tripod, while the backpack held either my Canon 500mm lens or the 100-400mm lens, plus extra coats and clothes and food. The Tamrac camera bag held my 100-400mm lens when it wasn’t in the backpack, my Canon 7D SLR, and my Canon M mirrorless camera, plus a water bottle for easy access (new water bottles for the trip too). I had intended to take the new bags on short hikes closer to home before the trip but ran out of time, so they got pressed into heavy duty service immediately. Not to worry, they both worked out great. I got constantly drenched on multiple days and while the dampness did eventually penetrate the bag, I had everything inside in smaller bags so everything stayed dry. I will probably look into a rain cover for future use, even though I typically don’t have to hike in such a steady rain, but it would be nice to have for emergencies. One thing I wish I had more of was stuff sacks for the extra coats and clothing I kept in the bag. I had one for one of my layers and attached the bag with key straps to the o-rings in the bag, which made it easy to find and access when I wanted to put on the jacket. But I didn’t have stuff sacks for the other layers and their zippers scratched the paint on the big white lens. Easy enough to rectify on my next Tom Bihn order. The Tripod Quiver I originally intended to attach to the backpack but found that carrying it on its own with the Absolute Strap was both comfortable and convenient. I took the tripod on every hike, something I’ve been loathe to do in the past, so that worked out nicely. All in all the new gear worked out well and made for more enjoyable hiking. The Tamrac camera bag certainly wasn’t new, I bought it the mid-1990’s and it has been with me on every hike since. Like the Tom Bihn bags, it was made here in the United States, and even outlived the company that made it. I was in graduate school when I bought it based on some research, as even though it wasn’t very expensive, every dollar was precious back then. Even so I never would have believed it would be my hiking partner two decades later, but here we are. It fits nicely in overhead bins of even puddle jumpers, so it’s easy to take on trips. Since it can sometimes be hard to judge the size of things when online shopping, I thought I’d provide this helpful size comparison of the Tom Bihn Guide’s Pack. 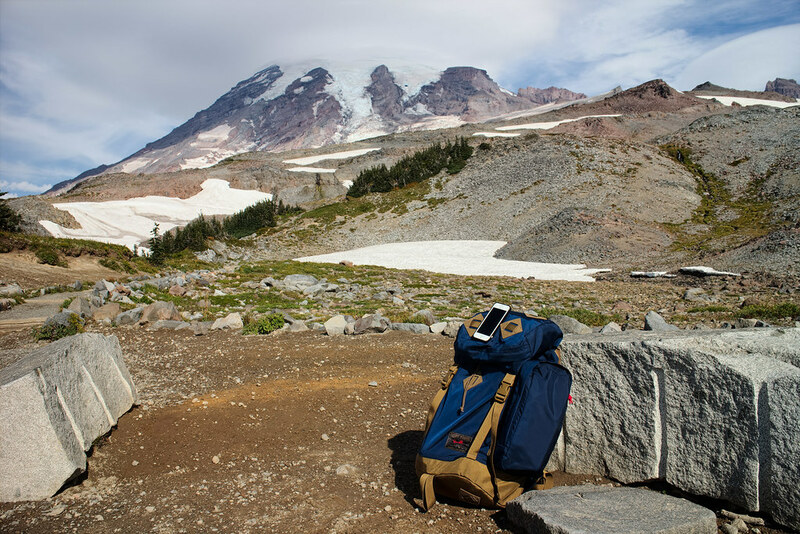 Based on my preliminary observations, I’d say it’s somewhat larger than an iPhone and somewhat smaller than Mount Rainier. 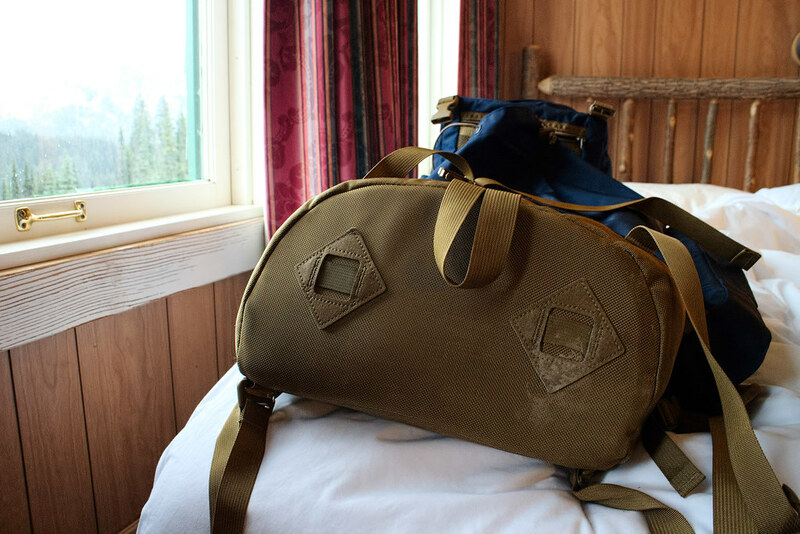 Up above the tree line on Mount Rainier there’s a fine dirt everywhere so my beautiful new bag didn’t stay clean very long, as this shot from my room in the Paradise Inn shows. Which is good, because I haven’t been hiking enough the past couple of years and it’s a sign things are headed in the right direction. A dirty bag on the trails is better than a clean one in the closet. 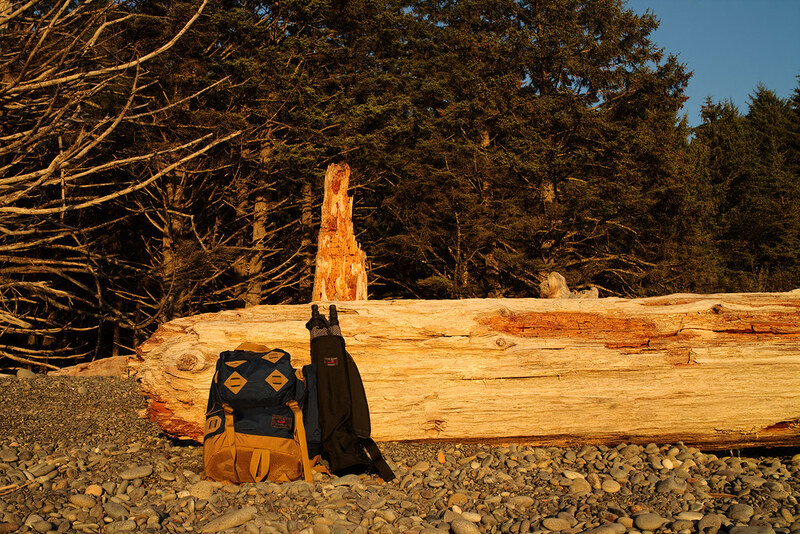 I was waiting for the sunset at Rialto Beach near the end of the trip and took a quick shot of the two new bags. The next morning I went to the Hoh Rain Forest and then drove back to my home in Portland. I’m not quite done getting bags, I’ve got my eye on an Aeronaut 45 for longer trips instead of my rolling suitcase, as at most of the places I stayed I had to carry the suitcase and the duffel/backpack style of the Aeronauts would have been much more convenient, and maybe an Aeronaut 30 and/or a Smart Alec for shorter trips. As I imagine future generations will want to erect a statue in my honor, I thoughtfully posed in advance to ease the design process. I was thinking it could be 200 feet tall and sit where the Willamette flows into the Columbia, turning so I’m always facing the sun. Statues of my pets could rise and fall in the river in the order we lived together, so that Templeton’s ears would break the surface of the water at sunrise, followed by Scout’s a while later. When Templeton descends back into the river, Emma and Sam would start to rise, and so on. 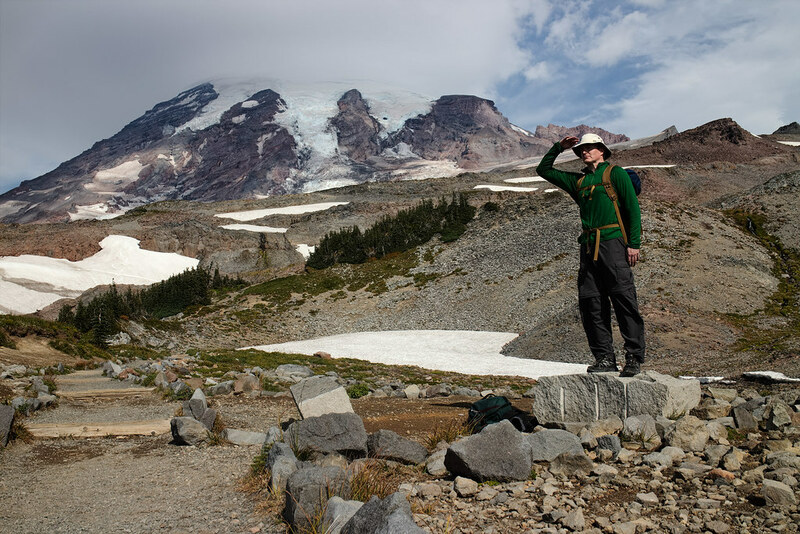 In this picture I’m in front of Mount Rainier, but don’t put the statue there, that would be a little ostentatious.